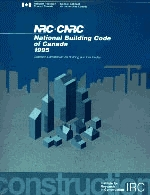 The National Building Code of Canada (NBC) is prepared by the Canadian Commission on Building and Fire Codes (CCFC) and is published by the National Research Council. NBC is essentially a set of minimum provisions for the safety of buildings (and telecom structures) with reference to public health, fire protection and structural sufficiency. It establishes a standard of safety for the construction of telecom structures (and buildings) which includes extensions, alterations and evaluations of any upgrades and removal of unacceptable hazards. NBC is also responsible for releasing local wind data considered in design of telecom structures. The standard utilizes wind pressure (in Pa) based on 10, 30 or 100 years recurrence probability. In Canada, it is the responsibility of the design engineer to determine the applicable wind pressure and ice loading based on the National Building Code data. The client should provide site-specific data such as antenna loads and the frequency bands, required tower deflection at antenna levels to assist the design engineer to determine the required tower serviceability, twist and sway. The standard may also be adapted for international use; however, it is necessary to determine the appropriate wind information and ice load at the site location in the specific country based on local meteorological data.